Jon Danzig's World: Should prisoners be allowed to vote? • Should all prisoners be refused the right to vote? In the UK all convicted prisoners are denied the right to vote. Firstly, it’s probably helpful to understand the history of prisoner voting in the UK. It’s quite complicated, because it wasn't always the case that all prisoners in Britain were denied the vote. The long road to democratic representation for all people – men and women, titled or not, rich or poor, of all ages - has been slow, tortuous and required many heated debates over hundreds of years. Between 1430 and 1832 only around one-in-five men could vote. The Great Reform Act of 1832 gave more people the vote – but only if you were a man who owned property, and so the majority of working men still could not vote (and no women could vote). The first law against prisoner voting in England, Wales and Ireland was the Forfeiture Act of 1870, which barred any felon sentenced to more than 12 months imprisonment from voting. However, although the law allowed short-term prisoners to vote, they couldn't for practical reasons: they were not allowed to leave prison to go to the polling booth. In addition, prisoners were not permitted to use their home address on the electoral register whilst in jail. In due course, the law would also prevent prisoners from registering their prison address as their residence on the electoral register. In those days, voting was not yet considered a universal right, with the democratic principle of one person, one vote, of equal worth. Until 1918, voting rights were only granted to men who owned property. This was changed in 1918, when women of property were also given the right to vote, but only those aged 30 and over, whereas from 1918 all men aged 21 and over could vote (with or without property). Women didn't achieve equal voting rights with men until 1928. Up until 1948, business owners and university graduates were also allowed additional votes. The Representation of the People Act of 1948 introduced postal voting on a limited basis, for those "no longer resident at their qualifying address". Consequently, those imprisoned for 12 months or less – as stipulated in the 1870 Act – could now use a postal vote, so long as they remained registered at their home addresses. At about the same time, Scotland took a somewhat different route: their Criminal Justice (Scotland) Act 1949, combined with the introduction of postal voting, resulted in the removal of any limitations on prisoners in Scotland from voting. In the General Election of 1950 some short-term prisoners in England and Wales did make use of the new postal vote. The Times then reported, "among the postal votes to be returned in Manchester were a number from prisons in Cardiff, Lincoln, Preston and Manchester." The Criminal Law Acts of 1967 removed any distinctions between felonies and misdemeanours. The result was that only prisoners convicted of treason would be barred from voting. This brought the law in England, Wales and Northern Ireland into line with Scotland, by removing the limitations on prisoner voting. "By Section 2 of the Forfeiture Act 1870, conviction of a felony resulting in imprisonment for over twelve months disqualifies the offender from holding office under the Crown, or various other offices; from membership of either House of Parliament; from voting at elections … and the Government agree with the Criminal Law Revision committee that these automatic disqualifications should not be continued." In effect, the new law meant there were no statutory restrictions on prisoner voting in all of the United Kingdom from 1967. However, there were still practical restrictions on criminals voting who were in prison for more than a year. That’s because, although the 1948 Act permitted postal voting, this was only allowed for those, “no longer resident at their qualifying address” (i.e. their home address shown on the Electoral Register). So a prisoner might only be able to cast a postal vote during their first year in prison, because every year a new Electoral Register would be printed which could no longer list the prisoner’s previous home as their “qualifying address”. Since it was not permitted to register a prison as a “qualifying address” on the Electoral Register, postal voting would no longer be possible once the new Electoral Register was published. But the lifting of statutory restrictions on prisoner voting was short lived. Just two years later, Parliament had a change of mind with the Representation of the People Act 1969, which banned all convicted prisoners from being allowed to vote in the UK, including Scotland. "A convicted person during the time that he is detained in a penal institution in pursuance of his sentence … is legally incapable of voting at any parliamentary or local election." There was curiously no Parliamentary debates about prisoner voting during the passage of the 1969 or 1983 Acts. It’s thought by some political commentators that this was because the issue simply wasn't considered important, as opposed to the lowering of the voting age to 18, which Parliament agreed to in the 1969 Act. The issue of prisoner voting was only considered again by Parliament for the Representation of the People Act 2000. This gave prisoners on remand the right to vote. Although the 1983 Act only prevented convicted prisoners from voting, in practice this also included remand prisoners (i.e. those charged and detained, but not as yet convicted of any crime) because of the restrictions on registering prison as a “qualified” residence on the Electoral Register. The 2000 Act therefore was not presented to Parliament as restoring a right, but simply making it practically possible to exercise an already existing right. This was achieved by enabling prisoners on remand to register their prison address on the Electoral Register. The government view then, as it seems to remain now with the current government, is that “absence of rights, including the right to vote, is part of the punishment of a convicted prisoner." The UK was ordered to end its universal ban on convicted prisoner voting, although a partial ban would be acceptable. The Labour government of the time managed to adroitly duck and dive the issue, and rather conveniently (for them) handed the controversy on to the next government, a coalition of Conservatives and LibDems, voted into power in May 2010. However, the House of Commons, following a backbench debate on the issue in February 2011, overwhelmingly voted to retain the current ban on all convicted prisoners from voting. 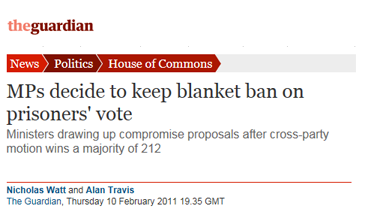 Just 22 MPs voted against continuing the ban, but 234 MPs voted in favour. Subsequently, in March that year, the UK government appealed to the Grand Chamber of the European Court of Human Rights against the Court’s previous order that the UK should change its prisoner voting policy within six months. On 11 April 2011 the Grand Chamber rejected the UK’s appeal, and gave another deadline of six months from that date for new “legislative proposals” to be introduced in the UK on prisoner voting rights. In November 2012, the UK government published a draft Bill, The Voting Eligibility (Prisoners) Draft Bill, for pre-legislative scrutiny by a joint committee of both Houses of Parliament. The Committee published its report in December 2013 and recommended that all prisoners serving sentences of 12 months or less be allowed to vote in all UK Parliamentary, local and European elections. However, the UK government has not responded substantively to the Committee’s recommendations, and did not schedule the Bill for consideration in the current Parliament. This means that the issue of prisoner voting will not be considered again until after the next General Election in May 2015. In September 2014, the Council of Europe committee that oversees the decisions of the European Court of Human Rights, decided to postpone any decision on the issue until at least September 2015, giving the UK – and the current government and the next government – a further breathing space on this issue. If the UK ultimately refuses to obey the Court’s ruling, it will be the first time one of the 47 signatories to the European Convention on Human Rights will have declined to comply with an order of the European Court of Human Rights. In the meantime, in October 2013, the UK’s Supreme Court dismissed the claim of two prisoners – both serving life sentences in England for murder – that the ban on their right to vote had been a breach of their human rights. The UK Supreme Court ruled that the blanket ban on prisoner voting was not incompatible with European Union law. In contrast, in August this year the European Court of Human Rights upheld its earlier ruling that the blanket ban on prisoner voting was a breach of prisoners human rights. The Court decided, though, that ten prisoners in Scottish jails who had appealed to the Court for damages were not entitled to any, as the ruling in their favour was sufficient. 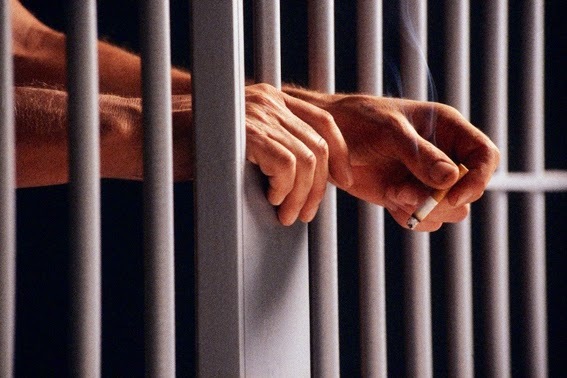 Most prisoners have not committed crimes that warrant a life sentence. Most will eventually be released from prison. It’s in everyone’s interests that once out of prison, they do not commit any further crimes, but instead become useful members of society. That involves reform whilst still in prison, and rehabilitating offenders to think - and act - more positively about their civic duties and responsibilities. One of the most important contributions citizens can make to society is to take part in our democracy and vote. It doesn't make any sense to me that removing the obligation of a civic duty (i.e. voting) should be considered a "punishment". So, I don’t believe that a complete, blanket ban on all prisoners from voting is useful or beneficial to society. If we believe reform is possible, then voting should not only be a right, but actively encouraged among those prisoners who will one day return to our communities. How that is arranged practically is something our Parliament needs to re-consider, debate and decide without further delays. Apart from anything else, the continuing and protracted conflict on this issue with the European Court of Human Rights - the legitimate jurisdiction of which was agreed by our Parliament back in the 1960s - needs to be resolved. The Court ruled that an automatic blanket ban on all prisoners voting is a breach of human rights, but that a voting ban on some categories of prisoners only would be acceptable. One idea is that those convicted of sentences of less than, say, two years should not lose the right to vote; and those who are serving longer sentences should have the right to vote restored to them a year or so before their release date. A blanket ban on all prisoners from voting seems too drastic and is clearly incompatible with the European Convention on Human Rights. Britain was the first country to sign the Convention in 1950, and it was British lawyers who drafted the Convention based on the English, and United States, Bill of Rights; the French Declaration of the Rights of Man, and German Basic Law. Winston Churchill was a strong proponent of the Convention. At least 18 European countries, including Denmark, Finland, Ireland, Spain, Sweden and Switzerland have no ban on prisoner voting. In France and Germany, only some prisoners are denied the vote. European countries which do not allow prisoners any right to vote include Bulgaria, Estonia, Georgia, Hungary and Liechtenstein. Human rights do not mean that someone cannot be suitably punished or imprisoned for a crime once fairly tried and convicted. Human rights mean that all humans deserve that society, and the State, protect them from abuse of their basic civil rights. If the State can be allowed to abuse humans – any humans, for any reasons or excuses – then how can we justify laws against humans abusing other humans? How the State behaves must be reflective on how we want all humans to behave. 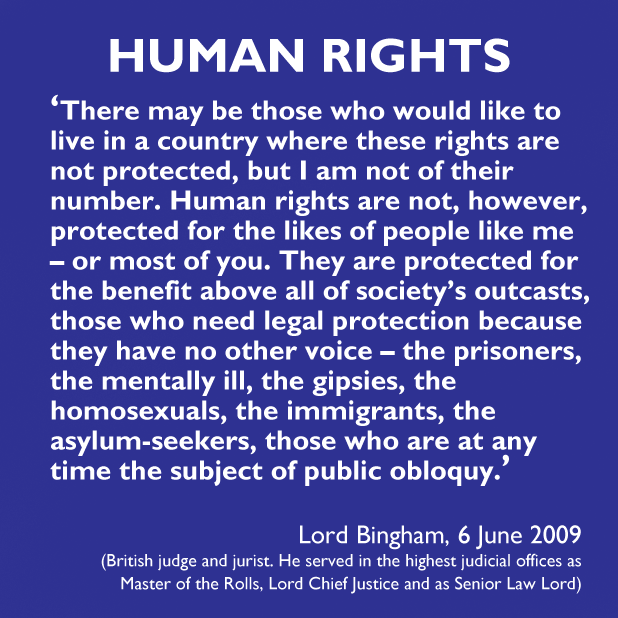 Human rights are meant to be universal, which means the rights apply to all humans without exception; to you and to me; even to criminals and foreigners, and even to those humans we do not like. Once we take basic rights away from one human, we start to erode the basic protections for all humans. If certain sets of humans are excluded from civil rights, how do you know whether you might one day be in a category of humans excluded from protection? It’s safer to say that if you’re human, you have rights, without any other qualification. That’s my vote. What’s yours? Can't vote or don't vote? "How that is arranged practically is something our Parliament needs to consider, debate and decide without further delays". Jon our elected representatives did this in February 2011 and decided on no change. What is it about parliamentary democracy that you so dislike? John, thank you for your posting. It's true that following a backbench motion in February 2011, Parliament voted to retain the current 'blanket ban' on prisoner voting. However, since then a joint-House Parliamentary Committee has considered a government draft bill, The Voting Eligibility (Prisoners) Draft Bill, and recommended in December 2013 that all prisoners serving a sentence of 12 months or less should be permitted to vote in all Parliamentary, European and local elections. In my view, Parliament should have the opportunity to consider and debate the Committee's recommendations. Furthermore, our Parliament agreed to the 1950 European Convention on Human Rights as a binding international agreement; in addition, our Parliament agreed to the mandatory and compulsory jurisdiction of the European Court of Human Rights. The European Court of Human Rights has ruled that the UK is in breach of the Human Rights Convention by banning the right to vote for all prisoners. States cannot simply ignore a Court ruling that they are in breach of the Convention, and the current situation cannot be left as it is. The Court's rulings are binding on governments. Thus, my comment that Parliament should consider this further without delay. The issue is not going away and needs to be dealt with as a matter of urgency. That's my view.